Boaz Michael reflects on recent anti-Jewish and anti-Zionist trends in Protestant theology. Part one of a three-part study of Jewish spirituality and the gifts of the Spirit in 1 Corinthians 12–14. Toby Janicki discusses the role of song, melody, and music in Judaism and Messianic Jewish expression. The revelation of the kingdom comes through prophetic words of knowledge, wisdom, and faith. In Part one of this three-part study, D. Thomas Lancaster explores Jewish spirituality and the gifts of the Spirit in 1 Corinthians 12-14. "Music is the universal language of mankind." — (Henry Wadsworth Longfellow). Toby Janicki discusses the role of song, melody, and music in Judaism and Messianic Jewish expression. Jacob Fronczak also continues his outstanding series of the five Solae of Protestant theology with a provocative article about Sola Gratia, "Grace Alone". Is "grace alone" a purely Protestant concept? In this series we are taking a critical look at the Five Solae, the theological building blocks of the Protestant Reformation.. Refer to Messiah Journal #111, #112, #113, and #115. What is the connection between Jeremiah and the prophetic call of Yeshua? In this article, Aaron Eby investigates this connection and shows how understanding this will help us unlock the meaning of Yeshua’s teachings and understand them more deeply than before in light of his mission of redemption. 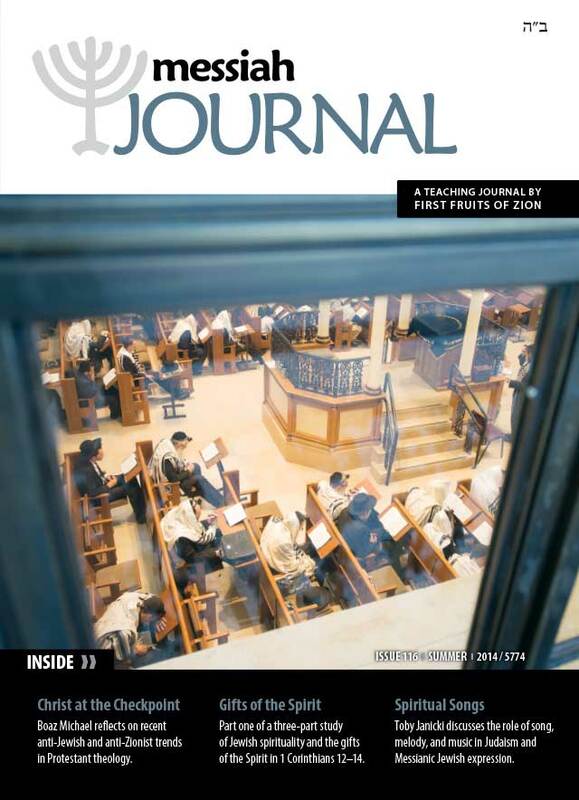 Previous articles by Aaron Eby in this series, focusing on Redemption in the Tanach can be found in Messiah Journal #110, #113, #114 and #115. This series of articles will Jeremiah Michael explore the theme of exile and redemption in the Gospel of John. Each article will deal with a different aspect of this theme. The end goal of these articles is to give the reader a new perspective on Yeshua’s teachings and miracles as they are presented in John. An exciting new Vine of David biography about one of Messianic Judaism's founding fathers. Part 2: Bram: The Life and Wisdom of Messianic Jewish Pioneer Abram Poljak in his own words. The devaluation of the Hebrew Bible leads to a worldview far removed from that of Yeshua and the apostles and opens the door to the denigration of Israel, replacement theology, and anti-Semitism.